on 5-28-09 the challenge was to make a shape card. No excuses, I'm late, (a day late and a dollare short), but I'm going to post this card at three clovers anyway, cause I think it turned out so, so cute! 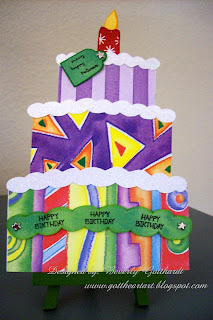 I had ordered The Shaped Card kit-Paper Flair, from www.PaperWishes.com , I just love shaped cards, but I didn't want to cut up the book and wanted to use my own choices of papers. So I made some templates from the book with good old fashioned tracing paper and Wah-Laa. Paper Wishes has a neat website and catalog, go check it out, you'll like it. Supplies: Card Blank-7401PW-Paper Flair Shaped Card kit, patterned paper-Provo Craft Scrap Pads-Bright Kids, DCWV The Christmas Glitter matstack-white and yellow, CTMH marker-citrus leaf, Sharpie marker-red and orange, Sakura Gelly Roll Pen-Clear Star, The Paper Studio Spare-Parts-mini star brads, Ink: Ranger Archival Ink-Jet Black, Stamps: Studio G Clear Stamps VS4911, Clearly Wordsworth VO26. This is SO fun and SO cute!! So glad that you linked us up! Thank you so much for participating in last week's 3 Clovers Thursday Card Challenge! now that is entirely too cute for words; I really love the paper choices!